Human Angiostatin - Haematologic Technologies, Inc. Selected proteolytic cleavage sites within the human plasminogen molecule are illustrated. Cleavage of plasminogen by elastase yields "angiostatin" (kringles 1-4) or angiostatin-like fragments (kringles 1-3). HTI’s "angiostatin" product is derived from a single cleavage within the plasminogen molecule resulting in a product that includes Kringles 1-4 as well as the NH2-terminal 78 amino acids that are absent in the elastase generated product. 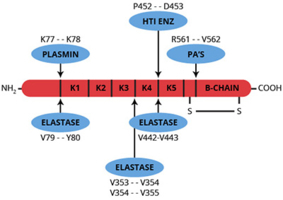 (K1-K5 = the 5 kringle domains, B-CHAIN = catalytic domain of plasmin, and the arrows indicate the sites of proteolytic cleavage by plasmin, elastase, HTI’s proprietary enzyme, and plasminogen activators (PA'S)). Angiostatin is a single-chain, proteolytic fragment of glu-plasminogen which has a molecular weight of about 38,000. It is a potent inhibitor of angiogenesis and was first identified and isolated from the serum and urine of tumor bearing mice (1). The mouse protein reportedly extends from threonine-98 through valine-440 (numbering from the NH2-terminus of glu-plasminogen). This fragment of mouse plasminogen, as well as the human equivalent, includes four out of the five kringle domains of plasminogen (1). The inhibition of angiogenesis by angiostatin is directly related to inhibiting the proliferation of endothelial cells (1,2). Because tumor growth is known to be angiogenesis dependent, it was initially hypothesized that the inhibitory properties of angiostatin would have clinical utility in arresting various cancers that are expressed as solid tumors. Studies performed in animal model systems have since demonstrated that recombinant angiostatin effectively suppresses tumor growth and metastasis (3,4). Numerous enzymes have been identified which will convert plasminogen to angiostatin or at least to angiostatin-like fragments. The enzymes include several matrix metalloproteinases as well as urokinase and a tumor cell-derived reductase (5-10). The precise enzyme or mechanism which is responsible for the formation of angiostatin in vivo is unknown and it is believed that there may be multiple pathways for the conversion of plasminogen to angiostatin. Structure/function studies have indicated that the first three kringle domains (and not the fourth) are responsible for the inhibitory properties of angiostatin, and that removal of the fourth kringle domain may actually yield a more potent inhibitor (11). HTI’s "angiostatin" product is produced by limited proteolysis of purified human glu-plasminogen using a proprietary enzyme preparation. The NH2-terminal sequence of this fragment is identical to human glu-plasminogen (Glu-1) and the molecule terminates at proline-452 thus making it larger than the "natural" or elastase derived product with an apparent molecular weight of about 50,000. Like authentic angiostatin, this product demonstrates an antiproliferative effect when tested in a growth factor-induced endothelial cell proliferation assay. The product is formulated in 20mM Hepes, 0.15M NaCl, pH 7.4, and should be stored frozen at -70oC or below. O’Reilly, M.S., et al., Cell, 79, 315 (1994). Folkman, J., Nat. Med., 1, 27 (1995). Sim, S.K., et al., Cancer Res., 57, 1329 (1997). Wu, Z., et al., Biochem. Biophys. Res. Commun., 236, 651 (1997). Dong, Z., et al., Cell, 88, 801 (1997). Lijnen, H.R., et al., Biochemistry, 37, 4699 (1998). Patterson, B.C., et al., J. Biol. Chem., 272, 28823 (1997). Stathakis, P., et al., J. Biol. Chem., 272, 20641 (1997). Gately, S., et al., Cancer Res., 56, 4887 (1996). Gately, S., et al., Proc. Nat. Acad. Sci. USA, 94, 10868 (1997). Cao, Y., et al., J. Biol. Chem., 271, 29461 (1996).